About Us Mobile Marine Models are completely dedicated to your total satisfaction. If you have any suggestions or comments please email us at mobmarmods@aol.com. Making A Purchase Making a purchase could not be easier. Just browse our 'Products' and click on any items that you wish to buy and put them into the shopping cart. After you have finished your selection, click on "Order" and you will be asked for a few details that we need to be able to satisfy the order. 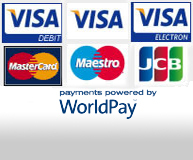 We accept all major credit & debit cards. Back-ordered items are not charged until they are shipped. You may send your credit card information via the On-Line shop, phone or snail mail. Hulls / Kits / Fittings / Accessories / Motors & Batteries...... go to Shopping Cart for present shipping costs. Deliveries outside of Europe..... P&P / Shipping is at cost. Please note:- You, the customer is responsible for paying any additional charges that may incur due to import duty / tax in your own country. Delivery Schedule We despatch your order(s) promptly, please allow 28 days for delivery of GRP hulls & Full kits..... as each and every hull is individually hand-laid. Returns Policy Goods 'damaged-in-transit' or faulty should be notified to the company within three working days. Any goods in this category will, at the company's discretion, be replaced free of charge. Any goods 'returned', undamaged, unused & free of faults must be returned within five working days of purchase. A 25% 'value-of-goods' handling charge will be levied for 'Returned goods'. There is no refunds for post & package / shipping charges. It is the responsibility of the purchaser for any costs involved in the returning of goods.